Being a Conservative Republican you can bet I have been called a racist a few times by the Looney Left. Just the fact that I voted and support President Trump has earned me the racist badge from many on the left. We are all aware of the big mess in the state of Virginia, the sexual assault charges against the Lt Governor Justin Fairfax is a big concern, but the black face picture of Governor Ralph Northam to me is no big deal. So he was at a party and wore black face, big deal. The fact that he is in favor of killing a new born child, that is a big deal to me. Let me tell you a story, when I was 12 years old I was a big Al Jolson fan, which I still am today. I was such a big fan that I used to do a good imitation of him, black face and all. Was I a 12 year old racist? No, I was just doing an imitation of an entertainer. I didn’t mean any disrespect to any black people, I didn’t do it to make fun or humiliate any black person, I was just imitating an entertainer. There is an old saying, “Imitation is the sincerest form of flattery” so if a white person is at a costume party or going to a Halloween party and wants to go in black face, so what. If a black person wanted to go to a costume party dressed as George Washington made up in white face, that wouldn’t offend me in the least. We have to face the fact that there are people today that are over sensitive and go out of their way to find something to complain about. As for me, being called a racist is no big deal, after all there are worst things I could be called. 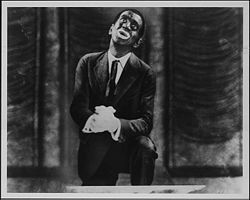 Now before you start calling Al Jolson a racist, do your homework. Back in his day he was the only entertainer to invite black entertainers to his home, the only one to go out to dinner with them. He helped and supported black causes and he was praised by black entertainers for his help and support. Just because someone wears black face doesn't necessarily mean they are racist.